Teaching part-part-whole relationships is critical while teaching addition and subtraction. For students to build a solid understanding of addition and subtraction, they need to understand what each one represents. While helpful when working with equations with unknowns in all areas, it’s imperative that students have a solid understanding of addition and subtraction so they’re able to apply both skills in real world scenarios. Understanding part-part-whole is a much more effective strategy to teach for problem solving than keywords, though they still have their own place. One of the first parts to teaching part-part-whole is the unknown; the question. Students should have a lot of exposure with unknowns of varying types- variables, question marks, blank lines, boxes, etc to build the understanding that they all mean the same thing. It’s imperative that the unknown is in varying positions- especially to the left of the equal sign ( x = 6 + 2) so students learn its meaning. The unknown should be identified as a WHOLE or a PART early on so they are able to later transfer their learning to word problems. This is where keywords come in- students can use keywords to identify something as the “part” or the “unknown”. However, it always should come back to “part” or “whole” as that helps build the foundational understanding of the operations. Keywords should not be taught as the basis of understanding the problem and should not be a series of terms categorically memorized. However, they relate back to part and whole and can help students understand the context. You can download the part-part-whole poster above as a pdf by clicking on it. Addition is putting parts together to find the total, or whole. Children build this understanding by counting groups of objects together to find their total. Word problem keywords that indicate the whole is unknown: in all, altogether, combined, and sum. Students explore sums using manipulatives and build their understanding of addition, and their facts as well, through hands-on explorations. One of my favorite tools to model addition for students is this large, magnetic ten frame from Learning Resources. Because the magnets come in two colors, you’re able to represent both parts in the equation. I use these as models during lessons, but my students also love to use them when they’re working in centers or playing during Fun Friday. You can buy them from Amazon by clicking the link here or the picture above. I also created smaller versions for students using Scotch Expressions tape, cookie sheets, magnets, and colored dots. I divided each cookie sheet into four ten frames due to size, but one or two could easily be used on them. Each side of the magnet is a colored dot (the sides are different) and I put them in small containers in sets of 10. They are available for students to use during their independent work time to help them model and solve equations and can take more than one container if they need them for larger numbers. Students can also use base ten blocks to help them find ways to make a sum. Locking cubes could also easily be used to practice the same skill. Students explore the related numbers that are the “parts” that make the “whole”. You can have a predetermined amount of cubes already separated, or have students grab a handful and explore the numbers that can be connected to make that number. Subtracting is taking the whole and splitting into parts. This understanding is built in the same way as addition- through exploration with groups of objects. Giving students a group of objects to split into smaller parts helps build this understanding. The work with the base ten cubes or linking cubes above helps students see that the same total of objects can be split into parts of different sizes, and also that the two part sizes are inversely related. Word problem keywords that indicate a part is unknown: left, fewer, take away, and minus. Comparison problems are subtraction as the two parts are the known number and the number needing to be added to make the other number (the total). The keywords “how many more” and “how many less” represent comparison problems. Ten frames are great models for building comparison problems as students see how many more are needed to make the total. I love using divided plates to work with part-part-whole. For subtraction, I place all of the manipulatives (M&M’s and Skittles are a bit hit!) in the large section of the plate and then move the set amount into one of the smaller parts to match the equation. You can also write on the plastic plates with dry erase markers and label the “parts” and the “whole”. The plates and any sort of counters you already have on hand are a perfect resource for students as they work with addition and subtraction independently during centers. I love using these divided plates for working with part-part-whole. Plus M&M’s for the win! 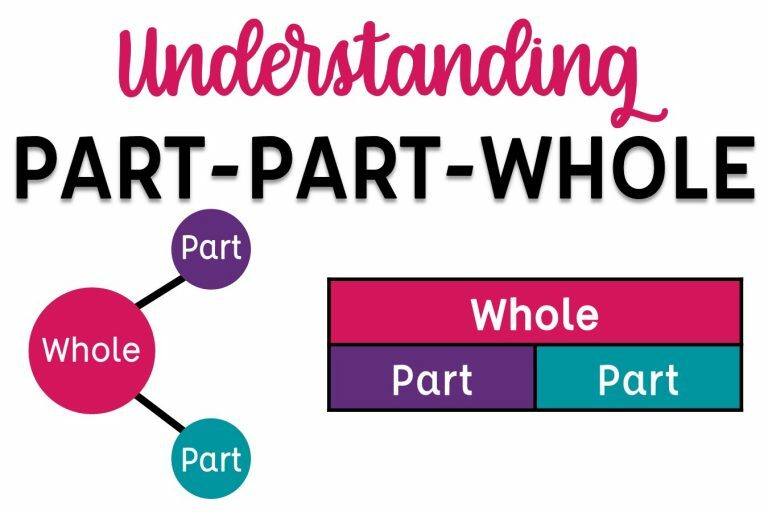 Teaching fact families should also be rooted in part-part-whole. Fact family triangles help students visually see part and whole relationships. When teaching fact families I use the house representation pictured below. I always put addition and subtraction equations as related to part and whole in the triangle for the roof to help keep students focused on the relationship between the two and help them understand fact family triangles. You can click the image above to download the poster as a pdf. When we work with fact families we also use our arms to build the triangle and help add kinesthetic movements into our learning. We put our hands together above our heads for whole and put our arms out to each side for each part (like the triangle above). The kinesthetic movements help students retain the learning and it gives them an easy tool to use later when needed. There are many different models for part-part-whole relationships. Two of the most common are bar models and number bonds. I find bar models to be the most helpful when working with word problems as students can visually see the parts relating to the whole and which portion is the unknown. Number bonds, in my opinion, are more relevant when looking at facts for a sum and building understanding of number relationships and fact families. Ten frames are also great tools to help students visualize part and whole relationships especially as students are working with numbers to 10. I have put together 12 pages of printables that you can use to work with part-part-whole models with counters, base ten pieces, locking cubes, or whatever else you have in your classroom. There are pages for number bonds, ten frames, and fact families. The pages include practice for both addition and subtraction. The equal sign is on the left of the equation on some of the pages. Two half sheet pages are also included for work in centers. All of the pages are black and white so you can print on colored paper and laminate, or print and use right away. You can click here to download the Part-Part-Whole Printables. Students’ understanding of addition, subtraction, and part-part-whole is evident with their understanding of word problems. Through story problems, students demonstrate they can use the context to determine the operation being used and can apply it independently. Students become successful with story problems through ongoing, spiral practice with varying question types. I do a story problem every day outside of my math curriculum to ensure students are experiencing varying problem types and spiral through the year’s skills instead of working with one skill at a time. My 1st Grade Word Problem of the Day come with two problems per page. There are two different formats: consecutive pages side by side and the same page duplicated side by side. My students have their story problem in their daily binder so I prefer to have them consecutively. If you want to duplicate them for students then the alternate format might be best for you. Through daily work with the word problems students complete part-part-whole tables, start-change-end tables, write equations, model problems, and write their answers in complete sentences. Students build their deep understanding of the 1st grade math centers through the daily practice and spiral. Students work with different problem types and build a strong understanding of part-part-whole and addition and subtraction. You can see the entire yearlong bundle in my TpT shop here or clicking the image below. The bundle is broken into month long sets and can be purchased separately. As a third grade teacher, when I introduce students to multiplication and division I relate it back to part-part-whole. We change the “part” to “# of groups” and “# in each group”. If students have a solid understanding of parts and whole they understand the multiplication and division relationship much more easily when it’s introduced and connected back to part and whole. When working with multiplication and division word problems, the focus is on whether or not the whole is unknown to determine which operation is being used. The four operations can be identified in word problems when students identify the unknown and given information as they relate to part-part-whole and groups. I have other math posts perfect for 1st grade teachers linked below. Just click on the images to head to the posts. I teach 3rd grade and was wondering if you have a poster for multiplication/division like what you described above. My students are having trouble with the part/part/whole concept. I am going to print the poster for addition/subtraction and it would great if I had a mult/div poster to put beside it to see the correlation. I teach STARS class with a lot of ESOL students and it would be helpful to have both posters side by side. I don’t (yet) since it’s not quite as simple since it’s with groups instead of parts. Are you looking for something similar to my anchor chart? Hi! I tried to click on the link for your part/part/whole worksheets. It keeps giving me the anchor charts that you created. Is there any way to get just the worksheets? Thanks so much!